The Transfiguration! What was it like? What did Peter, James and John see? Artists throughout Christian History have attempted to capture a “glimpse of the glory of Jesus” in paintings and drawings, some with the exuberance of Fr. James Hasse’s painting on the cover of the bulletin, others in more subdued tones. What is this amazing event all about? Yes, it is a “snapshot” of the Glory of God manifested in His Son Jesus. Yes, he is connected with the great ones of the past, Moses and Elijah. Some would say it is a glimpse of the glory of Jesus to be experienced in the future. Most of all, what Peter James and John saw was the Jesus of the present moment, an insight into his identity during his public life. 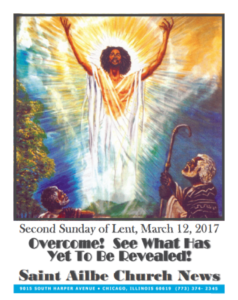 The transformation was change that took place when Jesus’ inner reality shone forth and transfigured his outer appearance.